Kanye West — the celebrated rapper, fashion designer, and provocateur — returned to Twitter this week. West deleted all of his tweets and stopped using the platform in February of 2017, shortly after defending his meeting with president-elect Donald Trump after the 2016 election. West’s return was exciting (exciting enough that Twitter’s own CEO, Jack Dorsey, welcomed him back) for a number of reasons. For one thing, it heralded the start of a new publicity cycle tied to a new album. For another thing, West’s old tweets were endearingly candid. “No way Spirited Away is better than Akira … NOOO WAAAY … sorry was just looking at a youtube of top 10 anime films,” he posted in December of 2011. Kanye surfs the net and gets mad, just like you! The culmination of Kanye’s big return to Twitter happened on Saturday morning, when West issued an endorsement of right-wing Twitter celeb Candace Owens. “I love the way Candace Owens thinks,” he wrote. Owens first gained notoriety two years ago after she launched a Kickstarter for a site called Social Autopsy. The purpose of the site was to build a database of mean comments and cyberbullying, and then tie that activity to users’ real-world identities. If that sounds like doxing, you’ve reached the same conclusion as many of the people who criticized Owens for the well-intentioned but poorly considered idea. Owens told Select All in 2016 that she had never heard the word “dox” before asking for $75,000 to build her site. Among the people who reached out to Owens about her approach were Zoë Quinn and Randi Lee Harper, two frequent targets of Gamergate ire. Owens, who is black, also received racist and threatening messages from online accounts allied with the other side of the Gamergate coin. This resulted in Owens incorrectly believing that Quinn and Harper had directed an online hate mob in her direction, and Owens then produced a ranting series of tweets in which she, under the handle @socialcoroner, defended herself. Owens’s argument with Quinn and Harper quickly put her on the same side as Gamergaters themselves, and the movement — committed to fighting political correctness through swarming online harassment — capitalized on the fact that it had a black woman on its side. Owens became a frequent topic of discussion on r/KotakuInAction, the main Gamergate subreddit, and granted an interview to the Ralph Retort, a far-right blog. Like future Pizzagaters Jack Posobiec and Mike Cernovich, Owens was launched to (online) stardom through Gamergate and its fight against the real enemy: the intolerant left. And like Posobiec and Cernovich, Owens transitioned to MAGA content and building an audience of Trump loyalists during and after the 2016 election. She currently serves as the communications director for Turning Points USA, a conservative nonprofit. The best way to understand Turning Points’ style of discourse is that its members once wore adult diapers in public to protest college-campus speech policies. What Level of Brain-Meme Irony Are You On? To put it in meme vernacular, the web-savvy right wing often postures itself as a type of “galaxy brain,” bypassing political norms, social decorum, and conventional ways of thinking in the service of a greater society (a greater society, in this case, is one where poor people are punished and immigrants don’t exist). Luminaries of the online right quickly seized on West’s endorsement of Owens, including Roseanne Barr, who often tweets like a 4chan edgelord circa 2010. That Kanye, who told concert audiences that he would’ve voted for Trump, found common ground with Owens and her cohort on Twitter is not surprising. That a high-profile celebrity who feels he has been unfairly pilloried for controversial opinions (“BILL COSBY INNOCENT !!!!!!!!! !”) for years feels welcome in right-wing Twitter circles is not surprising. At a concert following the election, Kanye said, “A lot of people here tonight felt like they lost. You know why? Because y’all been lied to. Google lied to you. Facebook lied to you. Radio lied to you.” Distrust of mainstream news sources and monolithic tech platforms is a common sentiment among the MAGA crowd. Many of these personalities, like Alex Jones, Cernovich, Posobiec, and Paul Joseph Watson, instead host their own news programs on video platforms like YouTube or Periscope. Doing something akin is Scott Adams, the creator of Dilbert and frequent Infowars guest, who now spends much of his time trying to unpack Trump’s persuasion skills on social media. This afternoon, Kanye posted a number of clips — footage of his computer screen recorded on his phone — from a 22-minute Periscope stream Adams hosted yesterday called “Scott Adams tells you how Kanye showed the way to the Golden Age. With coffee.” In it, Adams speaks of “prisons of the mind” — mind-sets that limit how people think. One of these so-called prisons is the idea of history repeating itself (if, for instance, you assume that history doesn’t repeat, Trump’s ascendancy to the Oval Office becomes possible). If you watch the full stream — which I cannot endorse doing — you’ll find that Adams’s argument is essentially that the mere fact that Kanye acknowledged Owens, a rare meeting between a top-tier celeb and an online personality, is leading people to look at the world with a different mind-set. West’s posting of multiple clips along with the hands-raised-in-celebration emoji certainly looks like an endorsement of this argument. The other tab open in West’s browser was from a 2007 TED Talk from Ray Kurzweil, who came up with the idea of the singularity, the merging of man and machine. What fans should make of all of this is unclear. Maybe it’s a cynical ploy to stir up album buzz. 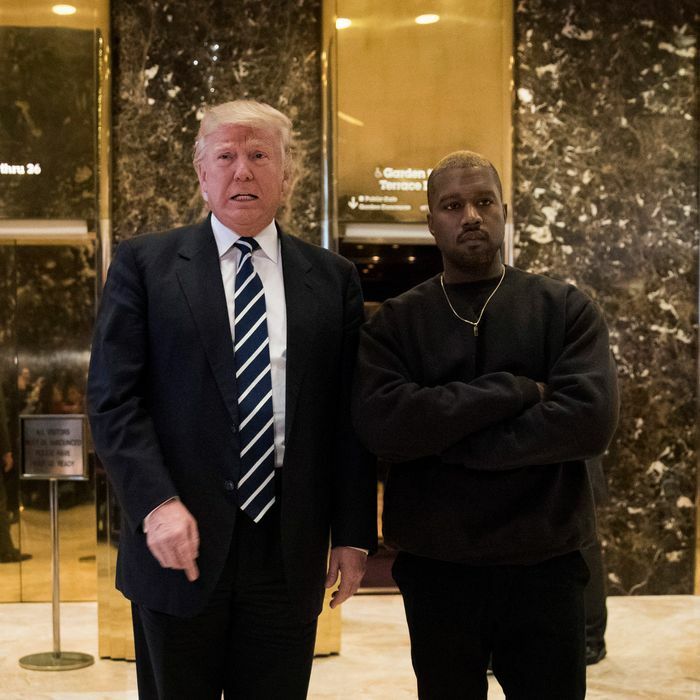 Maybe Kanye really wants to Make America Great Again. Or maybe he wants so badly to find a new way of seeing that he turned, like millions of other Americans, to see what the unconventional thinkers and devil’s advocates were saying on YouTube. Now, the online right is using Kanye’s endorsement, blasted out to 15 million followers, to further its own agenda — policies that exacerbate racism, discrimination, and economic inequality.